Wu Chia-Ching (Wu is the family name) was born on the 9th of February 1989 in Taiwan. 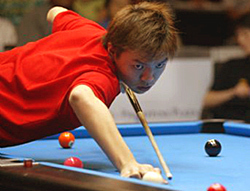 In the 9 ball world he is known by the nick name: 'Taisun' or 'Little Genius'. From the age of 2, Wu was raised by his grandmother. Around the age of 10, he began playing 8 ball pool at the hall run by his family. As his game improved, his grandmother would ferry him from one competition to another on her scooter! In the year 2004, he was the runner-up at the 2004 Junior 9 ball World Championship but then in 2005, Wu stunned the 9 ball world by becoming the youngest player ever to win the WPA World 9 ball Championship at the remarkable age of 16 years and 5 months. At the same Championships in the following year (2006), Wu was the top seed unfortunately however losing to Renato Alcano of the Philippines in the quarter-final. Incredibly, also in 2005, Wu won the WPA World 8 ball Championship, and this made him the first person ever to hold both the World 9 ball and 8 ball WPA titles in the same year. In 2006, a remarkable change in appearance came over Wu when he managed to lose 27 kg in weight. He attributed this to a strict diet of vegetables, meat and the rice dish: congee helped along by a daily jog of between 2 and 4 km. 2006 World 9 ball Championship, last eight.